Browse to the POS folder and verify that files posgreen.exe and fpos.dll exist. These two files are the minimum required. You will also need at least one dll name matching dbc*.dll and several other dlls. If these files are missing, verify your anti-virus has not quarantined them. Remember to whitelist the POS folder inside your anti virus so it does not happen again. Are all browser machines affected? If so, verify the store server is running. Can you open the browser pages on the server itself? If not, reboot the server. If yes, you probably have a network connection issue. iPad? Verify that the browser is not using "Private" mode which can affect connectivity and operation. Private mode turns the browser background to white on black, rather than the normal black on white. A Pos licence is mainly used to allocate a globally unique number to the computer, rather than being about Fieldpine revenue protection. With Fieldpine centrally controlling the allocation of numbers this ensured no duplicates ever existed, but in some circumstances the delay in requesting a new licence from Fieldpine is not acceptable. The method used by Fieldpine to tie the licence to the machine does not co-exist well with Windows 10 which can mean a licence needs to be reissued after Windows updates itself. To workaround this, P2015 reduced the licence mode and allows you to enter unique identifiers directly. Where NNNN is the unique id value you wish this lane to use. This number must be unique across all machines in your trading environment. Warning. When using weak licencing, it is important you do not start two machines with the same unique id. If you copy the folder in Windows to another machine, remember to change the unique id. To help with this, you might like to enter the setting using the following format which ties the setting to the name of the computer. Replace "MYPC" with your computer name, as given by GetComputerName() call in Windows. We will continue anyway as it might work, or it might simply crash. 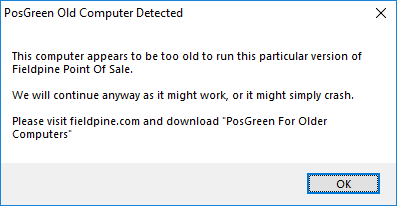 Please visit fieldpine.com and download "PosGreen For Older Computers"